Engaging read, peppered with lessons in the media relationship with a judicial system designed to ensure a free press. McCraw has a wry writing style that makes the relatively few pleas for the reader to pay attention that much more compelling. Not one to yell "fire" in a crowded room, McCraw's narratives about a rich, litigious society hell bent on controlling and suppressing damaging info on themselves is well timed and welcome. We sure do miss transparency, normalcy, and free speech! Times are changing and along with it is the ego of the all mighty white male who feels perched high above far superior and much more intellectual than ever before. This is the plight of the white supremacist and the white rage that is sweeping the nation from coast to coast emboldened by one leader who demands loyalty and expects invisibility as being above the law. The rules don't apply to malignant narcissists after all I should know I marr We sure do miss transparency, normalcy, and free speech! The rules don't apply to malignant narcissists after all I should know I married one and was nearly destroyed in all ways from one. However, our nation is under attack. Specifically our democracy and our ability to decipher fact from fiction. The lack of checks and balances, the new pressure to go along to get along, the us v them mentality is seen in all aspects. Media is no longer able to utilize free speech with such an authoritative figure on board steering the ship off course. What we now see daily is what I lived daily the fight of flight response. The fear, the anxiety, the eggshells, the constant threats of intimidation, the manipulation, the gaslighting, the cease and desist (boy that was my ex narcs fav) and the constant bombardment of shame , blame, and full out lies. Is there no wonder those inexperienced in such fog and misery can't see the forest through the trees? This is the story here of the fight to restore law and order. The fight to restore our democracy. The fight to restore transparency in allowing the courts to rule the way they should be able to do freely without being superimposed by the far right. Thank goodness for hope because hope is all we have. I'm so sorry our nation has to endure the same ill effects from toxicity that I faced for over 13 years. Thank you to David, the publisher, NetGalley,and Aldiko for providing such fine examples to explore this new norm that can never become normalized! This is a memoir of the last decade or so of the NY Times attorney. He talks FOIA, the First Amendment and the importance of truth. He explains why he wrote the most viral lawyer letter of the era and the responses he got from colleagues and bosses. He talks how Trump changed the battleground - not simply by calling the press the enemy of the people, but by devaluing truth and selling big lies. A good memoir, probably more interesting to attorneys and members of the press, but overall it gives a This is a memoir of the last decade or so of the NY Times attorney. He talks FOIA, the First Amendment and the importance of truth. He explains why he wrote the most viral lawyer letter of the era and the responses he got from colleagues and bosses. He talks how Trump changed the battleground - not simply by calling the press the enemy of the people, but by devaluing truth and selling big lies. A good memoir, probably more interesting to attorneys and members of the press, but overall it gives a good idea of the legal mindspace of the most respected newspaper in the USA. 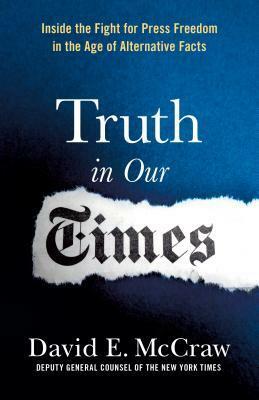 I am in process of writing a 1,000-1,250 word review for publication in a weekly indie because I consider this book a must-read for those nervous about the president's attempts to control his administration's narrative by giving "alternative facts" and constantly bullying the press (all major news organizations besides Fox News), including, e.g., twice condemning the press as " the enemy of the people ." This book is so perfectly timely and edifying, without at all being didactic. It reminded me I am in process of writing a 1,000-1,250 word review for publication in a weekly indie because I consider this book a must-read for those nervous about the president's attempts to control his administration's narrative by giving "alternative facts" and constantly bullying the press (all major news organizations besides Fox News), including, e.g., twice condemning the press as " the enemy of the people ." It reminded me that America's First Amendment is much, much stronger than I remembered and than most people realize. Our press is the most free in the world, unburdened by the prior restraints and post-hoc punitive measures present in other democracies. And yet, the truth is under siege by an administration that pounds the table with labels of all major news (but Fox News) as "fake news" while comfortably substituting fiction in place of facts.